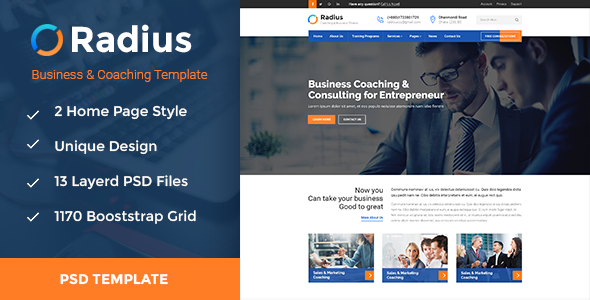 Radius- Coaching & Business PSD Template Created by CreativeGigs. This templates have specific characteristics, namely: Radius – Coaching & Business template is designed especially for training, coaching and business and those who offer business related . You can use this Radius- Coaching & Business PSD Template on Psd templates category for advisor, analytical, audit, broker, business, business psd, company, consulting, consulting template, finance, financial, insurance, radius, trader, trading and another uses. Xpreime – Minimal Personal Portfolio PSD Template.